Maid service By arrangement, payable locally. Final cleaning extra. Near Cabris in 3/4 acre, this is a modern and exceptionally comfortable villa with spectacular views along the whole coastline from large poolside terraces and an infinity pool. The surrounding area offers plenty to do: Lac St Cassien nearby is a local beauty spot with watersports, there is golf about 5km, horse riding about 8km away and the coast is about 25km to drive. The villages of Speracedes and Cabris are pretty and have good restaurants. Inside the house is a pool table, gymnasium equipment and large infinity pool from which to enjoy the views. Large attractive sitting room with three large sofas in front of fireplace and sliding doors giving onto the terrace. Flat screen TV with satellite TV (freeview channels) and magnificent sea view. Open plan dining room between living room and kitchen, with seating for 10 and French windows leading to the terrace. Fully equipped kitchen with cooker, hob, microwave, 2 dishwashers, 2 fridge/freezers and separate laundry room with washing machine and dryer. There are five bedrooms with light-coloured and new en suite bathrooms. The four-poster beds are king size. Bedroom one on the first floor: four-poster double bed, countryside views, chaise longue, roll top bath in the bedroom, and bathroom with basin and wc. On the ground, bedroom two: four-poster bed, access to terrace and garden, dressing room and en suite bathroom. Bedroom three: twin beds, windows leading to the garden, en suite bathroom. 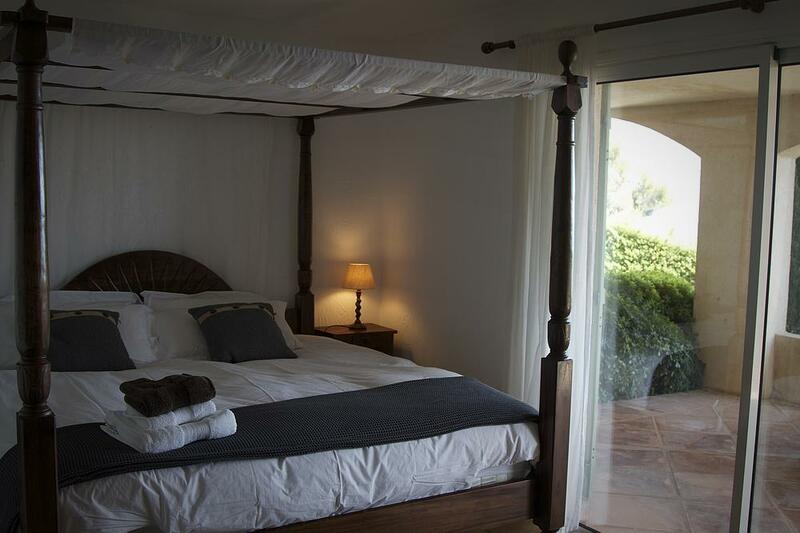 Bedroom four: four-poster bed, windows to the garden and terrace, en suite shower room with walk-in shower. Bedroom five with decor for children: four-poster bed, no views, en suite bathroom. In the games/tv room are pool table, large tv and sofas. There is a gym room with 2 gym bikes, cross trainer and other gym equipment. Outside is a very large terrace outside the living room with remote-control electric awnings and built-in barbecue near the pool, and outdoor dining table for 8-10. Seats are high-quality rattan with cushions. The swimming pool is 10m x 5m and between 1m and 2.5m deep with infinity edge and beautiful views of the sea, Esterel Hills and Lac St Cassien. It is heated and has a cover, and 10 very high-quality sun loungers. This property is not suitable for families with small children. There is an electric gate and secure parking for two cars plus a garage.